Perhaps I was ten years old, or even younger. I remember the quiet of his dimly lit studio. My father would sit at the dining room table, newspapers covering the worn surface, brush in hand, focusing all his attention on the paper in front of him. Only the shrill cries of his birds interrupted the silence. I would be as still as possible, almost always reading a book, so as not to disturb him. No matter what the season, it always felt to me like a late winter afternoon, just before nightfall. He wrote words in Chinese that I could not understand; at that time, I thought these were letters home or business propositions. I now wonder if these indecipherable characters were part of the body of poetry he crafted throughout his life. I visited my father in his top floor walk-up from the time my parents separated, and subsequently divorced, when I was two, until he died when I was twenty. During those years, my father’s paintings inhabited my visual world. They covered every bit of wall space in his Greenwich Village studio on East Tenth Street. More paintings were stacked in piles against the walls. My father’s works were hung alongside his collection of “masterpieces” bought in Europe and in the flea markets and thrift shops of New York. He believed that these scavenged paintings – oils signed by artists such as Leonardo, Soutine, Van Gogh, and Cezanne — would make him rich one day, but this would never came to pass. These were all fakes. Every inch of space was filled with the art and projects of his life: paintings, writings, Chinese musical instruments, inventions. On other visits, my father taught me to play chess, a pastime we continued to enjoy together. He had invented a complicated variation on chess and checkers for two, three, or four players called Tri-King, which he marketed and vigorously promoted. After expending much time and energy, ultimately borrowing money to help realize this project, he lost both his investment and his dream of wealth. 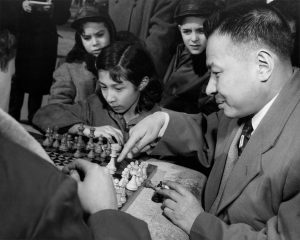 Although never a source of financial stability, chess was for him a lifelong fascination. My father loved to cook. We shopped for food in the cavernous markets on the Lower East Side, and then he would prepare a feast in his wok. Smoke filled the whole studio. He drank as he cooked and as we ate. I clearly remember the ever-present bottle of sauterne on his table, from which he sipped day and night. Although he may have felt, as he once wrote in a poem, that he would “love brandy without shame before God,” ultimately he paid dearly for his love of wine. He suffered from bouts of alcoholism. He was often depressed. In my father’s presence, I felt an overwhelming sadness that I dared not express. Many times, he would tell me how hard he worked day and night without reward, how success eluded him. Even as a child, I clearly understood this reality and it broke my heart. As a young man from China arriving in this country at the age of 15, he had many gifts and great promise. He pursued his goals in art with relentless passion; he had opportunities to exhibit his work early on in San Francisco, Paris and New York. But as the years passed, the attention he received dwindled. My father’s personal battles with racism, poverty, and the demons of alcohol took their toll. Although he was disillusioned and despairing, he carried on the artist’s never-ending struggle to make art, exhibit it, and at the same time, earn a living. He pursued his entrepreneurial projects doggedly with the dim hope of making a fortune. My father would tell me again and again that things were going to get better. They never did. In 1962 he had an exhibition in a New York gallery, but it was met with silence. In 1963 he died from stomach cancer at the age of fifty-seven. When we spent time together, my father would often reminisce about his home in China. He recounted memories from his boyhood, of sitting in one of the giant lychee trees behind the family house, gorging on fruit. My father maintained a strong connection to the natural world throughout his life; the tenderness for his menagerie of birds reflected this. He held a strong belief that plants and animals should be a source of inspiration for artists. In his letters to me while I was away at camp one summer, he urged me to pay close attention to my surroundings, as they would ultimately feed my creative spirit. I also frequently heard about Paris, the city closest to his heart. He felt that the art community there embraced him, unlike the lukewarm reception he experienced in New York. After rhapsodizing about the marvels of Paris, the bird show at the Hotel d’Ville, the flea markets where he bought “masterpieces,” the opera and the museums, he would talk of plans for a visit to France we might make together. Unfortunately, his precarious financial situation never allowed this wish to come true. My father would speak nostalgically about his many friends in Paris. But it was not until he died and I read his poems for the first time as a young adult that I realized the impact that these close and artistically nurturing friendships had upon his work. He kept company with such members of the literary elite as the poet, novelist and artist André Salmon; the author Pierre Mille; and the poet Paul Valéry. He painted expressive portraits of all three men and he wrote a poem for Pierre Mille expressing his deep sadness upon his death, and one to the memory of Paul Valéry proclaiming his loyalty to his dear departed “master.” But regarding one influential figure from his life in Paris, my father was consistently silent. My father never spoke of his first wife, the German-French poet, Princess Paule de Reuss. They had married shortly after he arrived in Paris, after meeting at Raymond Duncan’s salon. Their relationship was founded on a deep commitment to art. The princess acted as both muse and companion artist. They rendered likenesses of each other in paint and poem. Years later, when I went to Paris after my father died, Duncan told me that Paule and my father, both highly emotional people with a flair for drama, had an extremely stormy relationship. Duncan said that they were temperamentally unable to live together, but somehow remained friends all their lives. I learned that they corresponded through the years and she sent him her books of poetry. I discovered a letter Paule wrote to my father in 1960 expressing her long-standing regret over her failure to accompany him to America, and her continued desire to see him return to Paris one day. According to Duncan, her death in 1961 was the result of either an accidental fall, or an intentional leap from a window. 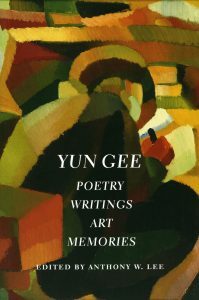 During his time in Paris, it is not surprising that Yun Gee’s focus on literary pursuits intensified. Painting and poetry vied for his attention, as he was both visually and intellectually stimulated by his surroundings and companions. While in France, my father made an album of his paintings and poems. He hand bound the pages and covered the volume in leather, a skill he learned from his teacher in San Francisco, Otis Oldfield. He pasted black and white photographs of his paintings on the pages of this album, which he titled “Period of Lyricism, Paris 1926-30.” He carefully copied out his poems in English and French, using black and purple ink in his fountain pen. The Chinese poems and texts were written with a brush. Opening that album always evoked in me the sense that his unique vision would always remain with me. I only need to turn the pages to find him again.